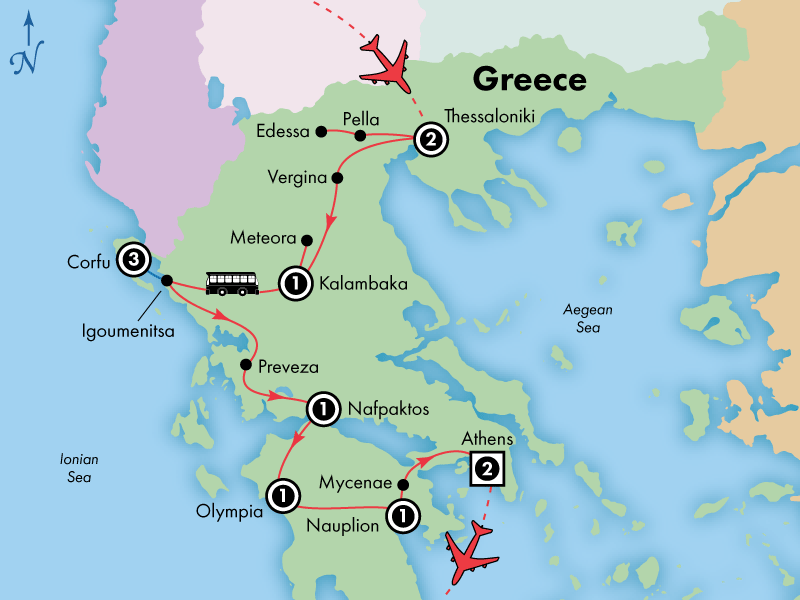 13-day Escorted Tour of Greece.<br/>The Birthplace of Civilization! 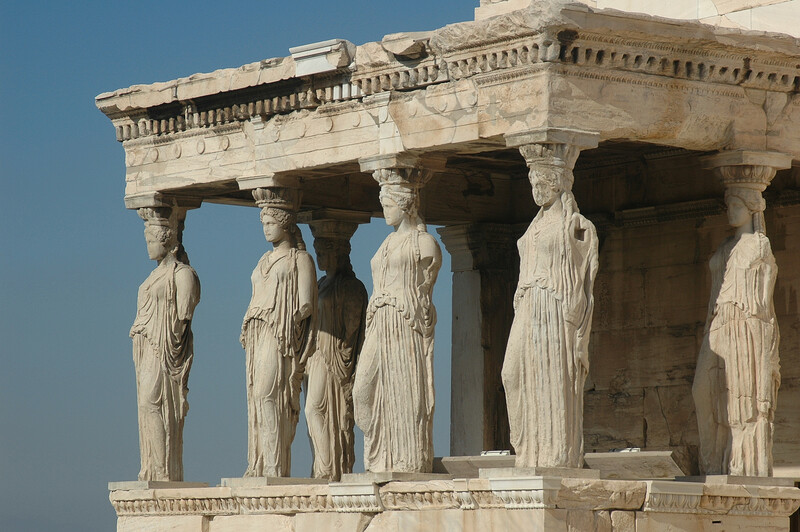 Great Opportunity to Visit Classical Greece! Birthplace of Civilization! – Other departure cities available. – Thanks to our small group size, we can get to the heart of our destination, visit places that other tours miss, and get to know the locals. – Visit Pella, birthplace of Alexander the Great and center of the ancient Macedonian dynasty. – In Thessaloniki, view the iconic 15th century White Tower, once used as a fort and prison. – View the Royal Tomb of King Phillip and the priceless jewels and treasures in Vergina. – Tour Meteora’s mystical monasteries perched in mid-air, a UNESCO World Heritage Site. – Ferry to dazzling Corfu, with its dramatic coastlines, olive groves and miles of wild flowers. – Walk through luxurious Achilleion Palace built for Princess Sisi, the Empress of Austria. – Visit the archaeological site of Delphi and the imposing Temple of Apollo. – Tour the Achaia Clauss Winery and its vineyards in the wine region of the Peloponnese. – Enjoy a Greek cooking demonstration led by a chef who shares his culinary secrets. – Visit the archaeological sites of Olympia, birthplace of the Olympics. – Visit the picturesque town of Nauplion, the first capital of modern Greece. – In Mycenae, heartland of Greek mythology, visit the remarkable Tomb of Agamemnon. – Enjoy a fun filled night in Athens’ Plaka area with great food and great company! – Explore Athens – a living museum! Stand before the gleaming Acropolis and magnificent Parthenon. – Is This Trip Right for You? This moderately active trip covers a fair amount of ground each day. Expect from three to four hours walking every touring day. The pace is moderate, however you will encounter some uneven surfaces, stairs, steps and significant slopes. Your tour of Thessaloniki starts at the Arch of Galerius (Kamara), one of the most distinctive Roman structures in the city, built as a triumphal monument by the Emperor. On to the iconic 15th century White Tower, once used as a fort, garrison, and prison. Because of its fame as a notorious prison, it was also known as the “Tower of Blood.” At the Basilica of St. Demetrios, devoted to the patron saint of the city, you see a superb example of Byzantine religious architecture. Afterward, a closer look at the city’s Byzantine walls and panoramic views of Thessaloniki and the Gulf of Thermaikos before departing to the archaeological Site of Vergina in Central Macedonia. Considered one the most extraordinary finds of the 20th century, Vergina was the first capital of the ancient kingdom of Macedonia. Visit the Royal Tomb of King Phillip (father of Alexander the Great); view the famous “Vergina Treasures” including gold urns, jeweled wreaths, unique art, ivory, and armor, protected by UNESCO as a World Cultural Heritage Site. Continue to the town of Kalambaka, nestled at the base of inspirational Meteora for dinner at your hotel and some lively Greek Music! In this beautiful wine region of the northwest Peloponnese, visit the Achaia Clauss Winery, one of the largest wineries in Greece, founded in 1861. You’ll be charmed by breathtaking views of the gorgeous vineyards, the rugged stone buildings as you sample a few of the local varietals. After lunch at a local farm, visit the Archaeological Museum to view priceless Greek works of art such as the sculpted decoration of the Temple of Zeus, the famous Hermes of Praxiteles and the statue of Nike of Paionios. Tonight, enjoy a cooking demonstration, led by a professional chef, who shares his secrets of how to prepare Greece’s fabulous Mediterranean cuisine – with tastings, of course! Today explore Athens – an astonishing living museum! A panoramic drive takes you past the grand 4th century Panathenian Stadium built as a venue for athletic contests, the ruins of the Temple of Zeus and Hadrian’s Arch commemorating the Roman Emperor. Stand before the gleaming white marble Acropolis, the ancient architectural masterpiece built during the Golden Age of Athens, crowned by the magnificent Parthenon that rises above the city, a UNESCO World Heritage Site. On to the imposing modernist Acropolis Museum that brings together the surviving treasures of the Acropolis, showcasing layers of history by floating above the ruins with the Acropolis visible above. The rest of the day is yours. Be sure to walk to Constitution Square, to catch a glimpse of the colorfully-costumed Evzone guards, outfitted in traditional Greek style. On the last night of your journey in Greece, enjoy a farewell dinner at a local restaurant. Kaló taxídi! Package pricing varies based on travel dates, city of departure, type of occupancy and other factors. Please contact Grand Escapades for a detail price. OPC Indemnity Fund fee of $1 per $1,000 of travel products sold is applicable. Limited space, certain restrictions may apply. Not all travel dates available. 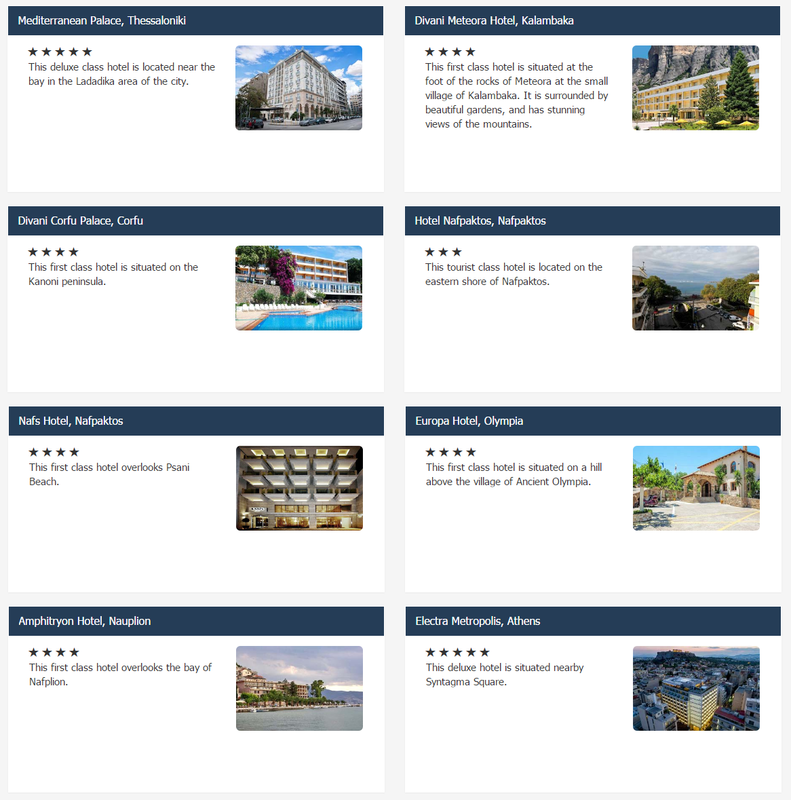 Hotels indicated may be substituted with others of the same or higher rating. Offer is Subject to change or cancellation at any time. Note: itinerary can change depending upon the day of the week you depart.